PRODUCT DESCRIPTION: Low odor concentrate which is mixed with water and has a broad inside and outside label. Works well for several pests and not only kills insects quickly but also repels them. Please note this product comes in many different sizes as listed here. TARGET PESTS: Most insects including Ants, Bees, Boxelder Bugs, Centipedes, Chiggers, Cockroaches, Crickets, Earwigs, Elm Leaf Beetles, Firebrats, Fleas, Flies, Kudzu Beetles, Ladybugs, Millipedes, Mosquitoes, Mud Daubers, Pillbugs, Silverfish, Sowbugs, Bees, Cockroaches, Scorpions, Spiders, Stinkbugs, Ticks, Wasps, Wood Infesting Beetles and just about any pest found on the outside of homes. WHERE TO USE IT: Outside or inside as needed. RATE OF APPLICATION: 1 ounce to a gallon of water; 1 gallon of mixed solution can cover 500-1000 sq/ft of surface area depending on what you're treating. For porous surfaces like raw wood, you'll only get 500 sq/ft per gallon. For painted surfaces, vinyl siding, etc., 1 gallon of mixed material can cover 1000 sq/ft. I have three cats in the house; will this be safe for them to be around if I use it indoors? Also, my problem is with ladybugs. Is it more effective to use this outside, around my home, or inside around windows and doors? If you review our Ladybug control article, you'll learn that in general, the Cypermethrin is best used outside on the homes exterior to keep ladybugs off the home. This will reduce the amount nesting on the home and getting into living areas. So be sure to treat in the fall to stop them from using the home in the winter. Now in the spring, you need to treat the same way to get them as they're leaving. This way all the ones you kill now won't come back next fall. You'll also see in our article that the recommended product for use inside is the Phantom or Dforce aerosol. And its not that the Cypermethrin won't work inside. Its just that either of these aerosol's are better suited for use inside. Personally I like the Phantom because it goes on "dry" and is odorless making it ideal for use inside – especially around windows and doors. But the Dforce will work just as well. 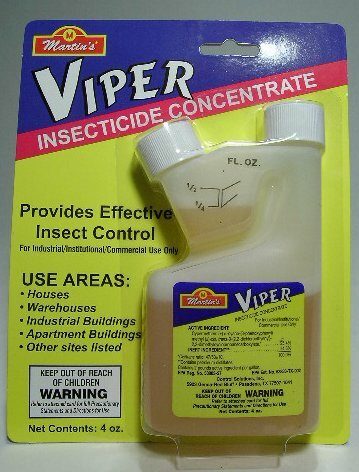 Can I use Viper in an insecticide smoker? Would it be safe? Are you asking if you can "fog" with Viper? I'm not quite sure what you mean by "insecticide smoker" but if its a hot fogger, then no, Viper would not be a good choice. This is because its a water based product and designed for use as a liquid spray and not as a hot fog. But we do carry several options that can be used in hot foggers. We also sell the deodorized oil separately and to save money, you can opt to mix your own spray using this oil and some Cirrus concentrate. This would be the better option if you fog a lot of material over the course of a year. Give us a call if you need more help. Our toll free is 1-800-877-7290 and we're open 9:00 AM to 6:00 PM Mon-Thur; 8:30 AM to 5:00 PM Friday and 9:00 AM to 1:00 PM Saturday, Eastern Standard Time. I have a 1 year old son and a small dog. Is this safe to use indoors and if so what areas? Can this be used with a hose end sprayer such as the GILMOUR DIAL-A-MIX 499? Absolutely yes. This sprayer has a dial used to set the flow of concentrate added to its tank and if you adjust it to .5 or 1.0 oz per gallon for Cypermethrin, you'll get the proper mixture needed for most any application. And if you're needing to spray a large area, well then a hose end sprayer can be a big time saver. No doubt it pumps product fast but more importantly, it can help by getting the thorough coverage certain jobs need. You just can't do this with any standard pump sprayer so for many jobs, this sprayer is the way to go. Will this product work for killing Cicada killer Wasps? Will the Cypermethrin hurt my vinyl siding as in stain or discoloring it? My wife sprayed some bee's with a spray I get from work called CRC wasp and hornet killer and it stained my siding. Also, I'm having an issue with hornets under my deck. It's a little wet at times and they seem to love going into the mud. Is this product going to keep them away from area? I'm currently redirecting water away to get rid of the problem but just in case I can't keep it totally dry will this help? No doubt any kind of "wasp freeze" contains all kinds of solvents which can stain. In fact, if you read the label on the can, I bet it says to keep the spray off of any plant, bush, tree as well as anything plastic, vinyl, etc. That's because of the solvents. Most every can of wasp freeze contains solvents which will kill any kind of plant, stain vinyl siding and some will even etch marks on glass. But Viper Cypermethrin won't do anything like this if you apply the liquid form. In fact its labeled for use on plants, siding, etc. and will also work great for treating the ground where you have wasps making nests. Basically if you mix up 1 oz per gallon of water, anything sprayed will die and where you spray it insects will avoid so it should prove to be the perfect material for your problem. I'm looking for a way to keep the bald-faced hornets off of my balcony but one that won't hurt the hummingbirds that feed there. Is Viper-C a good product for this (spraying the railing, floor, etc.)? Currently using EcoSmart Organic Pest Control which I had on hand. It does repel them for a day or two but it doesn't last very long. I'm 3 stories up and have no idea where the nest is. Viper would be a great option and it won't have any impact on the hummingbirds. Mix it at the rate of 1 oz per gallon of water and apply it to all exposed decking and rails that you want to protect. I happen to keep a couple of hummingbird feeders on my backyard deck and the nectar tends attracts both wasps and ants. But I use the Viper once a month on all the surfaces and it keeps these pests away quite effectively. My son recently developed a severe and potentially deadly reaction to Wasps and Hornets. Will this product kill both of these? Also, I see that this product is used as a preventative measure which is what I am mainly looking for along common walkways, sitting areas, etc. around our property. I read the component breakdown of Cypermethrin and it seems that it breaks down very rapidly once dispensed, especially in soil (1 to 2 days). How is it considered preventative? My last question relates to other animals. We are on a farm that has chickens, goats etc., is this product safe for all these type animals? First and foremost, Cypermethrin will provide long lastly residual. Certainly 30-45 days when applied out in the open environment; longer when used inside the home. I'm not sure where you got the 1-2 days but I assure you this is not correct. Now "pyrethrin" is very much a short lived active and though Cypermethrin is closely related to pyrethrin, its definitely very different in ma ny areas with one strong feature being that Cypermethrin is much more persistent. Next, its a great choice for keeping wasps and hornets away since they will readily detect it and avoid where its been applied. @admin: Thank you for the quick response! I got the info about cypermethrin from Wikipedia. Although I may have been confused concerning the 1 to 2 days (I've looked at several options for this). It says that it breaks down quicker in sunlight etc. but does not give a time frame. I do see that bifenthria and essentria ic3 also seem to be potentially good at the use I am looking for. Can you give me your opinion on the best option? I am looking more for a repellent than a killer. Although killing is just fine. Include some links for the best product for me. Thanks! Cypermethrin is what you need. Its way more "detectable" by flying pests and overall, more acutely toxic in the short term. So when its active, you'll get better results compared to either Bifenthrin or Essentria. Now Bifenthrin might last longer out in the open but it takes a lot longer to affect insects and it won't repel nearly as well so for your needs, the Cypermethrin is undoubtedly the way to go. Purchased this just in case I have issues with carpenter bees later on. I've been dealing with these for 2 years and just now thought that I can spray their nests (sort of). Turns out their galleries should be dusted and corked first, then you can spray the fence posts with this pesticide, but I'd already had a local pest company spray my posts before this purchase. But rather than stain the posts right away (to hold in the pesticide), I decided to purchase additional pesticide (a concentrate) that I could spray on in a couple months. An alternative is to purchase a paint/stain additive that will inhibit the bees from boring new holes. I used this product mixed in a pump sprayer to treat the inside of my house for a sudden bug infestation (small roach looking insects). That was four days ago and I haven't seen any moving since I sprayed. It does, however, have a pretty strong odor that took about 4 or 5 hours to dissipate. I also used it in my old barn this morning to try and reduce the wasps and carpenter bees. It seems to have worked. This product is amazing! I live in a cedar sided house and the carpenter bees were a big problem. I spray the house 3 or 4 times a year, depending on rain, and no more bees dive bombing you and no more holes in the siding. This even keeps the wood peckers away. Good. Works on stink bugs. If you plan on harvesting the Rhubarb than no, you won't want to use either since they're not labeled for use on fruits or vegetables. But we have Permethrin Dust and Vegetables Plus Permethrin. Both are labeled for use on garden vegetables and will work well on earwigs, sowbugs and a wide range of other pests. Great product! Worked like a charm. Perfect size for the job that I needed it for. Came to me in record time. Instructions for use and well packed. Thank you and I will continue to do business with this company. Spiders be gone! This is a very reliable product, quick action, low application odor that quickly fades. Very carpet friendly. I have never had an issue along a carpeted edge. Quick action and lasting effects. I would recommend this product. Great product and a Great company! I have purchased from BugSpray.com for a number of years to rid my property of Cicada Killers. At one point a few years ago, they had taken over virtually all of my lawn. I went to Bug Spray .com, purchased the Viper, and Spreader Sticker, and have now almost eliminated them entirely. Their products worked much better than the insect service I had used to get rid of these pests! Hey. Can this product be applied with a pressure washer with a chemical injector? It can. But you have to be careful the unit is able to mix it correctly. 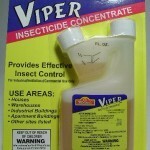 Viper is labeled for use at 1/2 to 1 oz per gallon of water. So if your machine can mix it this fine, you should be okay. But we've seen big variances with pressure washers meaning they can sometimes say they're mixing it at 1 oz per gallon but really be applying it at a much higher rate. So to be sure, experiment with it by testing the machine with some kind of "fake" concentrate. Pump out 5 gallons by filling a 5 gallon pail and if you can confirm the "concentrate" used for the test was reduced by 5 oz, you should be fine. This does work well. What a relief!! So tired of being bombarded by stink bugs, and this gets rid of them. I would recommend this product to anyone who has a bug problem. Used this outside around the house & in basement. Worked well for camel crickets , spiders, and Beatles. Would recommend. AWESOME! As you go On-Line today searching for an acceptable solution for the problem you are experiencing at the time, you ALWAYS wonder what will be the outcome. After I did my research, I placed an order…. WELL, this was a Bull's-eye. I cleaned my home in preparation of spray applications. Applied the product and within the week or so, I began to see a full reduction in the pest (Hister Beetles). I am convinced that the product works. Thank You. Today, they are almost gone and I have spray leftover. Fast ship, great product. Excellent transaction. Hi there. I was wondering if this is safe to use in a household with many reptiles (lizards) as pets? I've read that it can repel lizards by destroying their food source, but not sure if it would harm the lizards themselves if the product was used in the same room or in the house. Thanks! The general answer is no. When used according to the label, it won't pose a hazard to people or pets – even when used inside the home. An dsince lizards and other reptiles tend to avoid where this product is applied, they shouldn't be getting a significant exposure when applied properly. That being said, what is your target pest? We have many items for many different pests and if there could be another option better suited for use around pets given your concern. We have a wasp problem and they now live both inside and outside of our house, so looking for a product that would be safe for our pets (bird, dog, cat, and lizards). If you review our wasp control article, you'll learn there are two products which should be applied. First, puff Drione Dust into every crack and crevice you can reach. Focus on areas where you suspect they might be entering. Common entry points will include soffits, overhangs, gutters, windows, doors, shutters and under layered siding like cedar shakes or masonite. Apply the Drione with a Hand Duster. Drione will penetrate all these areas and make them unusable by insects like wasps. Furthermore, treatments will last 6-12 months so you generally only need to apply some once a year. After applying the Drione, let it sit for 1-2 days and then spray all exterior siding with the Cypermethrin listed above. Mix 1 oz per gallon of water and apply 1 gallon for every 500 sq/ft of surface area being treated. Cypermethrin is highly repellent to wasps meaning they'll stay away from treated areas. Reapply once a month until they're gone; once every 2-3 months to make sure they don't come back. It looks like it's working! This product, combined with the Drione dust, appears to be doing the job. We sprayed the whole exterior of the cabin this weekend after doing a complete exterior dusting last week. I usually find 10+ wasps in the Master bedroom every day. Today, 2 days later, I found zero. Zero! Finally it looks like we can stay in the cabin overnight. I found some stink bugs, but they were pretty much dead. Also see less activity outside with carpenter bees. They are awful this year in VA. I like it! Prompt delivery. Waiting for weather conditions to improve to use product. Can this product be put on horses to keep the horse flies from biting them? Its not labeled for use on horses (or any animal for that matter) so no, this would not be a good choice. Cypermethrin is good for applying to any surface where flies are landing such as the siding of a barn, the walls of a stable, etc. And for directly treating the horses, go with either Permethrin 10 or Essentria IC. Very good product. Easy to use and so far has worked as advertised. Super fast shipping ! Added to my favorites. Really good packaging. And above all friendly. I have wasps that are attracted to my children's wooden swing set/jungle gym. Is this a safe product for this type of application seeing that my youngest WILL put his hands in his mouth after touching the wood? Thank You for taking the time to read my comment. When mixed and applied properly, there should be no issue. This is because the product will be diluted and displaced so much there won't be a "significant" amount of material available for anyone to transfer enough from the wood onto their hands. This is even more "true" when the treated surfaces are absorbant. Such is the case when treating cement, wood, etc. Now if you're still not comfortable using this active, why not go with the NBS? This is a true repellent made with essential plant oils. It will work just as well at repelling insects like wasps and do so with even less cause for concern. Works A-OK! This stuff works very well. Good packing and fast shipping too. WOW'd – Great Stuff! OH MY!!! I am WOW'd by this product! I diluted it with water and put it in a pump-sprayer. I sprayed my entire house. (even though the wasps were only by my garage) I did it in the evening when the mud daubers are not active, and by the next day….I saw one wasp kinda look around and then he flew off…..I haven't seen them since. I was not expecting it to work soooo quickly, but it did. Now, I will do it again in 30 days whether I see more wasps or not, and then do it again 30 days later, I'm hoping I should be good till next spring. I combined 2 gal of water with 2 oz of viper cypermethrin into the pump sprayer. I put it on pretty heavy around garage area….and normally everwhere else. I have a fairly large house, so the nex! t treatment I will just do 1gal to 1oz. My recommendation is to start out with 1gal to 1oz and see if you need to mix more. Definitely buy this if you have a problem with Mudd dauber wasps. Finally!! I have had a problem with Cicada Killers in my backyard for about 5 years. This year I decided to try something new to get rid of them. I get up at the crack of dawn everyday, before the bees are moving about and spray this inside each new nest. I have had great success as there has been a female in each nest. Once I fill the hole, the bee crawls out and I stomp on it. Hoping for it it continue to work. Now, to find something to get rid of the males that are flying about. I could not trap the carpenter bees and after just 1 use they disappeared. Good product. This product worked really good. It took care of our cicada wasps. My hummingbirds can't feed at their feeders since honeybees found them. What can I use that will repel the bees without killing them but also not drive off the hummers? Thanks very much. Try applying Pest Rid to the hummingbird feeders surfaces where the bees are landing. I've used it to repel yellow jackets on my feeder. I used it just once and they never returned. It also stopped ants. Pest rid won't bother the hummingbirds and it doesn't kill insects either. This stuff is great. We use this every year along with spreader sticker for boxelder bugs. I watch so when they start to hatch I spray a couple times a day until I don't see any more. Its so nice not to have those pesky bugs all over the buildings. I recommend this to everybody. It's stink bug season. For several years we have been spraying a mix of dish detergent and water directly on bugs. It kills them but has no deterrent effect. Our goal is to prevent Fall swarming and late Fall nesting. For the exterior of the home, there is no better agent than the product listed above, cypermethrin. Mix 1 oz per gallon of water and expect to use 2-3 gallons to treat your homes exterior effectively. Cypermethrin will kill any active stink bugs there now and offer a strong residual which will keep others away and off your home for several weeks. The key to preventing stink bugs from invading every fall is to use a strong repellent and there is nothing better than cypermethrin. One treatment done now will last into October and if you do at least one more treatment by the middle of October, you should get excellent results that will carry over through the whole winter. I also recommend you read our Stink Bug article which goes over all other treatments/strategies you can do. As you'll learn, once a home has been "marked", more and more stink bugs will return every year to use the home for the winter. And though the exterior treating will help, you may still need to treat inside with the aerosol we list and set up some traps. These efforts will help minimize the problem for the whole winter just in case they're finding a way in you miss when treating the homes exterior. I've used Viper before in my home for German roaches and it broke their backs!! I've never seen anything like it!! I'm back in my home now so can I use it in a chest of drawers where clothing will be stored later? In kitchen cabinets, can goods, dishes, counter tops, etc?? How long should I wait before use after application?? Thanks!! These bait can be used without having to remove anything and you'll see plenty of dead roaches within a day or two after they feed. Looking for fire ant control, for about two acres, can this be used for this? We spot treat the mounds but with no real headway. No doubt the most complete way to treat a fireant mound is to drench them with a cypermethrin solution. Most mounds will take 1/2 to 1 gallon of material but if you have the time to treat and want to kill each nest completely and with no chance of them relocating elsewhere, this is the way to go. The standard process is to mix 1/2 oz of concentrate per gallon of water and then using a pick axe or rebar stake, make 5-8 holes in the mound just prior to drenching it. Next, pour the material into the holes and watch them die. In most cases, the nest is shut down within a few minutes and even if you have to treat 1-2 acres, the process could be completed in one morning. Hi, I have major stink bug issues all over my front porch & really all over the side(s) of my house for that matter. Their driving me insane, they really come out on warm days. From what I've read they live under the vinyl siding. I want to buy the above spray. How do I spray to kill the ones that are living under the siding? Or should I just spray on warm days when their out? I have thousands and thousands of them. Thanks you for your HELP! You'll need the Deltamethrin Dust and a good hand duster. Now if you can't reach most of the siding, a great investment is our Dustick. This will let you reach up a good 25 feet and is well worth the investment. We had an infestation on our Black Locust of twig bores. We killed them with PT-Cykick. We're waiting until spring to spray the tree with this to keep the parent moths away and kill any eggs they lay. Hello, I have a major major major roach problem I have been calling bug man after bug man and they want too much to treat. I got some viper from a friend of mine. Bugs are dying, so how long do I need to wait before I can use my kitchen cabinets again? I just read about the gel, and honestly I have never seen them this bad before in my life. I sprayed so much that i left a puddle in places. So live ones will wall through it. I haven't done the bottom cabinets yet. So just needing a time frame to clean up dead bugs and put my dishes back. If you take some time to review our cockroach article, you'll learn about the best approach to use for this pest. And as our article explains, you need to use a very different spray compared to Viper along with the gel. Unfortunately you've already sprayed with the Viper and though it will most likely kill a bunch of bugs, its not likely to kill them all. This happens because roaches can easily detect its Viper and will readily avoid where its been applied. This means some of the roaches will survive the treatments you've done and in turn, move to other areas in the home to form new nests and start reproducing again. For now, you can leave the treatments to let it run its course and after 4-6 weeks, if you're still seeing roaches, get our products and put them to use. Alternatively you could opt to wipe everything now in an attemtp to remove the Viper which would allow you to start anew using our recommendations. But if you tried spraying and baiting with our products directly over the surfaces you treated with Viper, it wouldn't work since the Viper would essentially destroy our spray and bait making by rendering it ineffective. Sorry for the bad news but maybe you'll get lucky… If not, get what we have in our article and I'm 100% sure you'll get rid of them for good. I have a number of black pines that have been effected with Eastern Pine Boror Beetles. I lost some but others seem to be holding on. I was told that the pines should be sprayed a few times a year to control any further infestation. Which product should I be using to accomplish this? Use at least 1 oz per gallon (up to 2 oz per gallon is fine too) and plan on spraying once in the spring and once in the fall using any of the listed sprayers we have in our article. I know it works. I've been using Viper since I moved to the mountains in 2009. We have lots of different insects and bees here, and it works on all of them. I've sold my neighbors on this product too. The best stuff! This is the only thing I have found that kills box elder bugs. It works great. I mix it with spreader sticker & keep some in my sprayer all the time so when I need to wipe out any kind of bugs I'm ready. It works! I have used this product for a few years to help get rid of Cicada Killers that seem to enjoy nesting in my yard. I go out early morning and evening and fill the holes. As long as I use this to get rid of the females, I don't have as many males flying in the yard. I had no problem with placing the order or receiving the product. So far, so good! I had a LOT of cicada killers for the second year. Ruining my lawn. I poured this in the holes. I saw a few for a couple of days but haven't seen any for about a week. The holes don't seem active anymore so I'm crossing my fingers this worked! My vinyl siding is a light cream color and I was afraid of staining the siding. Absolutely no stains. The spiders were crawling out everywhere and were dead in seconds. Great product! Order was delivered sooner then expected, just in time for STINK BUG invasion! Not so sure it was going to work since the words stink bug not on the kill list on back of bottle. Surprise, only after the product dried did it take to working. Ordered 2 bottles and it mixed enough for 2 story house around the windows. Seems a little pricey but don't care if it works. We are not totally bug free but seems better then if we have done nothing. We live right in their breeding grounds 60 acres of hay field, garden and woods. I am sure we will be purchasing more if needed. Both products are destroying a Box Elder infestation of my daughters home. I have used these products before on my home years ago with the same results. Highly recommended!! Best deal for sprays. Having bought and used bug sprays over the last several years, the bugspray.com dealers have been the best I've found. They are always ready to help with any info or needed sprays they sell. I have a huge problem with cluster flies. There are hundreds of them that plague the family throughout the winter months. Since they lay their eggs in damp grassy areas, would it be a good idea to spray VIPER CYPERMETHRIN on the grass? We have a 1/2 acre, but if that works, we would be willing to do it. We recently had a newborn and we worry about these insects. Thank you in advance. Did you review our article on cluster flies here? In the article you'll learn that once a house is "scented" (which means marked with cluster fly pheromone), flies from all over will come to your home every summer and fall. That means even if you could treat your whole property and your neighbors yard and his neighbors yard etc., you would never be able to treat enough land to prevent flies from finding your home. Cluster flies will literally "fly" miles looking for a good place to nest. And good places to them are homes which have had previous fly activity. For that reason treating your yard would be an effort of futility. True, it would kill developing flies. But the ones developing in your yard may not even be going to your home so what's the point? And even if you did kill them all, it won't stop all the countless thousands of others which will find your home this summer and fall if you don't protect it. Long story short, your best mode of defense is explained in our article. For now, set up window traps and treat around the windows with the Phantom we have listed. These two treatments will get rid of the problem in the living space. Next, dust the attic and as many wall voids as you can. After they get dusted, dust up under your homes siding using Drione. This alone should remedy the problem and then next fall, spray the homes exterior just to ensure more don't try to use it but if you a proper dusting, odds are high you won't need to spray. Taking away their points of entry with Drione is by far the best way to stop them from using a structure for over wintering. I've found that applying the combination of Viper Cypermethrin and the spreader sticker to the cicada wasp mounds per your instructions has been a very effective way of dealing with those pests. The recommendation of Viper plus Sticker-Spreader has worked great so far on my BB problem. There was a good initial knock-down as well as a good residual effect so far on the "Boxy Bugs". Is this a safe product to spray on a kids play set? The wasps land on the play set to eat the wood for their nest. They don't build their nest on the play set they just land on it and leave. My kids are so scared to play on it now. Would this product also keep the wasps from landing on the playset? Once the treatment dries, your children would not be exposed to anything hazardous. As explained in our safety faq's, the amount of material being applied is just not enough to pose a hazard. This product is easy to use, just follow the instructions to mix in your sprayer and spray where it is needed. It worked very well in our combat of these elm seed beetles. I am so very glad that I came across it cause nothing else I tried worked on these creatures. We have a cow pasture next to our house. The hundreds of flies lay on my house's siding and pool all evening to catch the sun. Will this work to spray directly on my siding? If so, how long will it be effective? In general, Cypermethrin is very active on flies and treatments should last several weeks (3-4). I'd start with a small amount of the concentrate to see how well it works. If it holds up long enough, you should be able to use it all season once a month and keep them away. But if you find its breaking down too quickly, change to Onslaught. It uses a "micro encapsulated" formulation so it will last 2-3 months for sure. But its not as "strong" initially so you might want to start with the Cypermethrin first. Excellent product. I had carpenter bees every year on ornamental bushes right next to our front windows and walkway..very annoying. I have tried for years and no luck to make them go away. This product worked on first application. Easy to use and assemble. I am happy to give this product five star review. Seems to be a good product. Ok- I have little black beetles that have infested my pine tree rows. Felled one 30’ and want to save the remaining. Is this product safe for me to apply in a sprayer that can reach that high? Mix 1-2 oz per gallon of water and reach up as high as possible. Works Great! Had a infected tall pine, took it down and treated the other pines. Does this product prevent mud dubbers from forming? Yes. Its highly repellent to them so they'll stay away from where its been applied. Does this work to repel rodents at all? Sorry but no. Its an insecticide and as such, will only work on insects. Now if you're looking for a good rodent repellent, use Pest Rid Granules on the ground and then spray over the top of them with Pest Rid Spray. Use this around the home to keep them out. Once inside the home, use our Ultra Sound Repeller to keep them out of attics, crawl spaces and living spaces too. We were infested! Knock down was immediate. Hoping it keeps them out of the house and garage this winter. We had serious paper wasp activity at the peak of our third floor porch under the eaves. We sprayed Viper through the screen onto underside of the eaves. Within two days the wasps were gone and not one wasp inside screened in porch (before using Viper, we had 45 wasps inside porch in one day). Now we can enjoy our porch! We've used BugSpray.com for 35 years (formerly U-Spray It). Great employees and product line. We ordered it on a Saturday and received it Monday!